WASHINGTON, DC -- Ukraine may have slipped from the headlines, but tensions in the country's Eastern region, where Moscow-backed insurgents operate, remain high -- and threaten to rise higher with a new influx of Russian troops and weaponry. 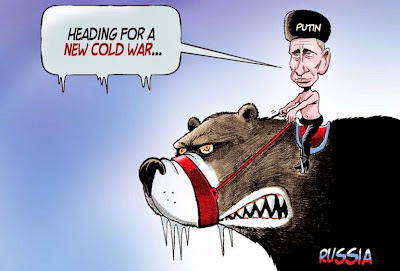 The chilly meeting between Vladimir Putin and Western leaders at the G-20 summit in Brisbane, Australia, over the weekend was a reminder of ongoing tensions between Russia and the West. Our options for curbing Russian aggression in Ukraine are severely limited; but at the very least, we must show that further escalation will carry a steep economic and political price. The cease-fire that Russia helped negotiate in the Donetsk and Luhansk regions of eastern Ukraine is de facto dead, if it was ever alive. But so far, neither the Ukrainian government nor Western powers have declared the cease-fire to be over. To do so would create pressure for new sanctions against Russia, which no one is in a hurry to introduce. Yet, if the rebels begin an offensive to seize more territory, this reality will be impossible to deny. Ukrainian President Petro Poroshenko has said his country is "prepared for total war," including a confrontation with Russian troops. While Ukraine may be in a better position to withstand a Russian onslaught than it was in late summer, it would still be heavily outmatched. But it is far from clear that Russia is prepared for full-scale war, which the Kremlin knows would be unpopular at home. Last spring, as Russian patriotic passions surged following the annexation of Crimea, close to 80 percent of Russians favored sending troops to Ukraine. By the fall, that number had dropped to about 40 percent, with just 13 percent saying they would "definitely" support an invasion. While the majority of Russians get their news entirely from state-run TV and profess to trust Kremlin-sanctioned news, there is some evidence that they are not entirely passive consumers of propaganda. In a recent poll by the Levada Center, Russia's premier polling agency, close to half of the respondents said they had heard about the deaths of Russian soldiers in Ukraine last summer. More than 40 percent said they approved of the work of citizens groups trying to collect information about such deaths, while only 9 percent took a completely negative view of such activities and only 12 percent said they didn't believe any Russian soldiers were dying in Ukraine. No less significantly, 68 percent said they would try to stop their own son from going to war in Ukraine. The possibility of discontent is heightened by economic hardship inflicted by Western sanctions and Russia's counter sanctions. In October, nearly two-thirds of Russians said they expected a drop in living standards and income in the near future -- and 56 percent, up from 45 percent in the summer, believed Russia's foreign policy could lead to economic crisis. While Putin remains popular, that could change quickly. It is likely that Russia's moves in Ukraine are not a prelude to full-scale invasion -- which would be especially costly with the onset of winter weather -- but muscle-flexing in response to Poroshenko's announced economic blockade of the region. To some extent, Putin is caught in a trap of his own making. He cannot allow Kiev to destroy the separatist enclaves without admitting humiliating defeat, and cannot fully support those enclaves without courting disaster. Putin hopes to perpetuate a "frozen conflict." The West hopes to keep up the pressure until Putin seeks a genuine resolution, even if it entails some face-saving compromise. For all sides, it's going to be a long, cold winter, with much walking on thin ice.